Chronic kidney disease (CKD) is a common and rapidly increasing global public health problem, both in developed and developing countries. The global prevalence of CKD is estimated to be 8-16%, and the disease burden is expected to grow. In India, recent studies have shown a variable prevalence ranging from 4% to 17.2% with wide regional differences., Globally, CKD is associated with high morbidity and mortality with approximately 735,000 deaths annually. Thus, CKD is the 12th most common cause of death and the 17th most common cause of disability. End-stage renal disease (ESRD) represents the terminal stage of CKD and is defined by a glomerular filtration rate of <15 mL/min/1.73 m2. There is a paucity of data in India regarding true incidence of ESRD. An Indian population-based study determined the crude-and age-adjusted ESRD incidence rates at 151 and 232/million populations. Different modalities exist for renal replacement therapy (RRT), such as hemodialysis and peritoneal dialysis; however, kidney transplantation (KT) remains the treatment of choice for ESRD as it leads to longer survival and superior quality of life. It is estimated that in India, 3500 patients undergo renal transplantation, 3000 new patients are put on continuous ambulatory peritoneal dialysis, and more than 15,000 patients begin maintenance hemodialysis in a year. ESRD treatment imposes a major financial burden on citizens in underdeveloped countries, and among all forms of RRT, KT was found to be least expensive., The first successful renal transplantation in India was performed in 1971 by the team led by Dr. Mohan Rao and Dr. KV Johny at Christian Medical College, Vellore. Since then, the program of renal transplantation has come a long way. The objective of the present review is to address the challenges encountered in KT in India and make recommendations for a successful renal transplant program. Recent data demonstrate that, globally, 2.6 million people were on dialysis in 2010, with 93% in high-or upper-middle-income countries. However, the number of people requiring RRT was estimated at 4.9-9 million, suggesting that about 2.3 million died prematurely because of lack of access to RRT. By 2030, the number of people receiving RRT around the world is projected to increase to 5.4 million. Most of this increase will be in the developing countries of Asia and Africa. In India, today, more than 200 centers are carrying out KT that depends heavily on living donors from near relatives. However, as per the Indian transplant registry maintained by the Indian Society of Organ Transplantation (ISOT) on their website http://www. transplantindia.com/, a total of 20,952 kidney transplants have been reported to them till date from a total of 48 centres only. As compared to cities, the awareness and affordability are lower in most regions of the country. 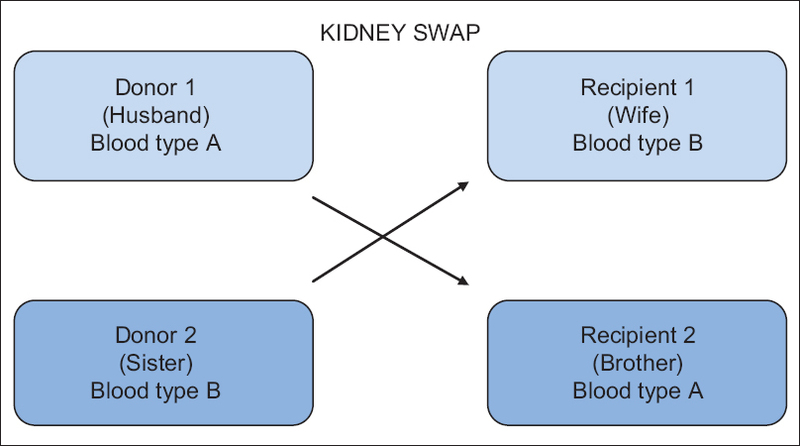 Apart from money, availability of live-related donor is a major cause for the ever increasing gap between the patients awaiting a KT and the patients who get a KT and results in a gross mismatch between demand and supply. Statistics suggests that about 150,000 people in India are waiting for renal transplantation. Only 1 out of 30 people who need a kidney receives one. Ninety percent of people on the waiting list die without getting an organ. Deceased donor (cadaveric donor) transplant can bridge this gap to some extent and can reduce the waiting time for KT and also the commercial transplantation. In the USA, 17,105 kidney transplants took place in 2014. Of these, 11,570 grafts were obtained from deceased donors and 5535 from living donors. In India, deceased organ donation program is still in its infancy, largely restricted to big institutions and hampered by the lack of a national policy for organ recovery or allocation. However, in the last 3 years, the numbers of deceased donors have more than doubled. The deceased donation rate in 2013 was 0.26/million populations, and this has gone up to 0.36/million population in 2014. India has approximately 180-200 kidney transplant centers and one-third of these are in the major metropolitan cities, most in the private sector. In the government-run tertiary care hospitals, maintenance dialysis, transplantation, and follow-up are conducted free of cost for the underprivileged section of the community. In the private system, there are two arrangements: One where transplantation is performed for a cost, which is nonprofit-oriented, and other where it is performed in corporate hospitals where the cost of transplantation and follow-up is high for the average Indian patient. In India, most of the KT relies on live donor transplantation; however, many states have established a strong cadaveric transplantation program, one such example is Tamil Nadu Cadaver Transplant Programme, which is the most efficient and effective. Many other nongovernment organizations (NGOs) have established organ sharing network, which promotes deceased donation program. The Foundation for Organ Transplantation and Education-Bangalore, Multi Organ Harvesting Aid Network, Narmada Kidney Foundation, Zonal Transplant Coordination Committee-Mumbai, Organ Retrieval Banking Organization-Delhi, and Delhi Organ Procurement Network and Transplant Education are some of the active groups. It prevents the exploitation of minors for organ donation. It suggests enhancing the penalties provided under the Act for commerce up to Rs. 20 million from the present Rs. 20,000. An application should be submitted to grant approval for removal and transplantation of a human organ, to the concerned "Authorisation Committee." Documentary evidence of relationship and documentary evidence of identity and residence of the proposed donor and family photograph depicting the proposed donor and the proposed recipient. A deceased donor transplant (Cadaveric) is a transplant where the donated kidney comes from a person who has died (concept of brain death). Brain death is defined as the irreversible loss of all functions of the brain, including the brainstem. The three essential findings in brain death are coma, the absence of brainstem reflexes, and apnea. High social risk donors: Donor is having a higher risk for transmission of infectious disease. Brain-death certification is made by a committee of four members which includes two registered medical practitioners (RMPs) nominated by appropriate authority, one neurologist or neurosurgeon, and the treating RMPs of the deceased person. In the absence of neurologist or neurosurgeon, any surgeon or physician, and anesthetist or intensivist, nominated by Medical Administrator Incharge and approved by the appropriate authority can sign the brain declaration certificate. Kidney transplantation has traditionally been performed by open surgery, but recently, a minimally invasive laparoscopic approach with robotic assistance has been described., There is a strong rationale for utilizing minimally invasive surgery (MIS) in the ESRD patients. MIS (with robotic assistance) led to smaller incision, lesser surgical infections and technical complications, minimum blood loss and decreased postoperative pain, shorter hospital stay and convalescence period, and better cosmesis. Transplantation procedure: Traditionally, the right iliac fossa is the standard fossa for KT, and the left iliac fossa is the preferred site for simultaneous kidney-pancreas transplantation. The ischemic time of the graft should shorten as long as possible, and temperature should be maintained between 1°C and 4°C. KT may be accompanied by multiorgan transplantation. In such situations, usually the more important transplantation (heart, lung, liver, pancreas, or small bowel) should be performed first. The detailed surgical procedure is beyond the scope of this article; details may be accessed in the book, "Comprehensive Clinical Nephrology" by Feehally et al. Immunosuppression: High cost of immunosuppressive agents and antibodies use for induction and treatment of rejection are often unaffordable for most patients, resulting in poorer graft survival rates. The absence of a renal registry to generate data for policy formulation. Most of the estimates are based on information derived from the few functional dialysis units and severely underestimate the gravity of the problem. The absence of well-formulated health policies and guidelines by the government. The absence of effective national health insurance programs that includes patients with ESRD. Lack of basic and essential medical infrastructure in most of the hospitals. The absence of adequately trained and motivated staff to run the renal replacement programs. Many of the trained personnel also emigrate to better-paying jobs in the developed world; it has been reported that more than 20% of Indian nephrologists have emigrated to the developed countries. The absence of meaningful research in the tertiary health units. Lack of cooperation within the various units. Poor maintenance dialysis programs: Many centers are restricted to urban areas and have few machines, which are often poorly maintained and run by inadequately trained staff. Many do not follow the prescribed guidelines and protocols for running these units. Infections: In the developing world, particularly in the tropics, the incidence of infection is much higher. Lack of awareness of brain-death concept, lack of organ donation awareness, low number of cadaver renal transplant centers with inadequate infrastructure, and personnel are the main barriers to deceased donor transplantation in India. Improve the socioeconomic status: Improvement in literacy, sanitation, and establishment of functional health program for better socioeconomic status. Implementation of ESRD and transplantation registries: The enactment of a solid organ transplant edict by the countries yet to do this is also essential as is the development of renal registries to enable more effective planning. We need to establish a transparent, independent, and functional national kidney foundation to serve the interests of the patients and to act as a unified group presenting their views to the government when the need arises. Implementation of guidelines concerning (a) evaluation of donor and recipient, (b) diagnostic and therapeutic procedures after transplantation, and (c) long-term follow-up procedures for donor and recipient. Newer techniques to reduce infections: There should be a continuous training to enhance the skills to reduce morbidity and mortality. Use of newer techniques in kidney transplant surgery may help to minimize postoperative recovery time and hospitalization. Commencement of national health insurance covering RRT: The majority of the patients cannot afford a transplant surgery due to financial constraints, and there being a lack of a national health insurance scheme. Scheme such as insurance coverage of RRT may help in mitigation of financial constraints. Public awareness programs focusing on the causes, prevention, and management of kidney disease must be encouraged. Greater efforts of trained transplant coordinator and nurse can empower the transplant program: The hospitals should be advised to set up a counseling service for individuals involved in organ transplant. The high cost of immunosuppression remains a major problem: Availability of immunosuppressive medications at affordable prices and government subsidies if possible, should be one of the focuses of such a kidney foundation. A common strategy should be adopted to reduce the cost of immunosuppression (i.e. Use of agents such as ketoconazole and diltiazem which inhibit calcineurin inhibitor metabolism). Transplant legislation should be mandatory: Transplant legislation should be developed by each country or jurisdiction for governing the recovery of organs from deceased and living donors and the practice of transplantation, consistent with international standards. Enforcement of deceased donor transplantation program: Deceased donation should be performed with altruistic motives and in a charitable manner. Cadaver renal transplantation involves declaring brain death, seeking permission from the relatives, retrieval of the organs, storage of organs, transport to the recipient's hospital, and ultimately transplantation. Future studies should focus on how to safely, ethically, and effectively use social networking sites to inform potential donors and potentially expand live and cadaveric kidney donation. Organ sharing network: It has worked on the principle that all organs should be utilized and not be wasted. A functional network for organ sharing exists only in a few states in India, at present. When the National Organ Transplantation Programme comes to existence in India, there will be a nationwide organ sharing network and utilization of donor organs optimally. National KPD program: To increase live related donor pool, transplant centers should work together toward a national KPD program and frame a uniform acceptable allocation policy. Future strategies will include regional, national, international exchanges, list exchange, three-way, domino chain, and nonsimultaneous KT. Singh AK, Farag YM, Mittal BV, Subramanian KK, Reddy SR, Acharya VN, et al. Epidemiology and risk factors of chronic kidney disease in India - Results from the SEEK (Screening and early evaluation of kidney disease) study. BMC Nephrol 2013;14:114. Singh NP, Ingle GK, Saini VK, Jami A, Beniwal P, Lal M, et al. Prevalence of low glomerular filtration rate, proteinuria and associated risk factors in North India using Cockcroft-Gault and modification of diet in renal disease equation: An observational, cross-sectional study. BMC Nephrol 2009;10:1-13. Modi G, Jha V. Incidence of ESRD in India. Kidney Int 2011;79:573. Garcia GG, Harden P, Chapman J; World Kidney Day Steering Committee. The global role of kidney transplantation. Lancet 2012;379:e36-8. Agarwal SK, Srivastava RK. Chronic kidney disease in India: Challenges and solutions. Nephron Clin Pract 2009;111:c197-203. Perovic S, Jankovic S. Renal transplantation vs hemodialysis: Cost-effectiveness analysis. Vojnosanit Pregl 2009;66:639-44. Wong G, Howard K, Chapman JR, Chadban S, Cross N, Tong A, et al. Comparative survival and economic benefits of deceased donor kidney transplantation and dialysis in people with varying ages and co-morbidities. PLoS One 2012;7:e29591. Garcia-Garcia G, Jha V, Tao Li PK, Garcia-Garcia G, Couser WG, Erk T, et al. Chronic kidney disease (CKD) in disadvantaged populations. Clin Kidney J 2015;8:3-6. New York: National Kidney Foundation, Inc.; 2015. Available from: https://www.kidney.org/news/newsroom/factsheets/Organ-Donation-and-Transplantation-Stats. [Last accessed on 2015 Aug 10]. Shroff S. Deceased Donor Transplantation in India. ISOT Newsletter; April, 2015. Kute VB, Vanikar AV, Shah PR, Gumber MR, Patel HV, Modi PR, et al. Facilitators to national kidney paired donation program. Transpl Int 2013;26:e38-9. Kute VB, Gumber MR, Patel HV, Shah PR, Vanikar AV, Modi PR, et al. Outcome of kidney paired donation transplantation to increase donor pool and to prevent commercial transplantation: A single-center experience from a developing country. Int Urol Nephrol Singh and Kumar: Kidney Transplantation in India 2013;45:1171-8. Kootstra G, van Heurn E. Non-heartbeating donation of kidneys for transplantation. Nat Clin Pract Nephrol 2007;3:154-63. Modi P, Pal B, Modi J, Singla S, Patel C, Patel R, et al. Retroperitoneoscopic living-donor nephrectomy and laparoscopic kidney transplantation: Experience of initial 72 cases. Transplantation 2013;95:100-5. Oberholzer J, Giulianotti P, Danielson KK, Spaggiari M, Bejarano-Pineda L, Bianco F, et al. Minimally invasive robotic kidney transplantation for obese patients previously denied access to transplantation. Am J Transplant 2013;13:721-8. Sood A, Jeong W, Peabody JO, Hemal AK, Menon M. Robot-assisted radical prostatectomy: Inching toward gold standard. Urol Clin North Am 2014;41:473-84. Salahudeen AK, Haider N, May W. Cold ischemia and the reduced long-term survival of cadaveric renal allografts. Kidney Int 2004;65:713-8. Adam DB, Nicholas RB, Michael LN. Kidney transplant surgery. In: Feehally J, Richard JJ, Jurgen F, editors. Comprehensive Clinical Nephrology. St. Louis, Missouri: Elsevier Publication; 2010. p. 1155-65. Jha V. Current status of chronic kidney disease care in Southeast Asia. Semin Nephrol 2009;29:487-96. Veerappan I. Deceased donor kidney transplantation in India. Health Sci 2012;1:JS010. Sinha K. Soon, National Body to Procure, Distribute Organs, The Times of India; 22 January, 2012. Available from: http://www. articles.timesofindia.indiatimes.com/2012-01-22/india/30652484_1_ transplantation-organ-banks-human-organs. [Last retrieved on 2012 Jun 10].